Cub Scouts… Cub Scouts! What’s not to love about little boys and Cub Scouts! I was able to serve over the Wolves (8 yr olds) and Bears (9 year olds) in our area back in 2008, 2009 and 2010. Then since the end of 2011 I have been able to serve as the Cub Master over all the Cub Scouts in our current neighborhood! One of my favorite parts of being over the Wolves and Bears was making Neckerchief slides! I loved watching the boys collection grow over the years and watching the boys show up wearing a neckerchief that was a year + old! So, one of my goals for the year is contribute to the weekly den meetings at least every other month with a new Neckerchief slide! And, I will be sharing those with you, here on Over the Big Moon! YEY! For my first one this year, I decided to have the boys make an American Flag! I also thought it would be fun for the boys to wear to next months Blue and Gold Celebration (don’t forget we have a Blue and Gold Printable Pack)! We did this as a Pack Meeting activity, so I didn’t want to use any Mod Podge or Hot Glue. This one is super nice, because you can put little “kits” together before hand. 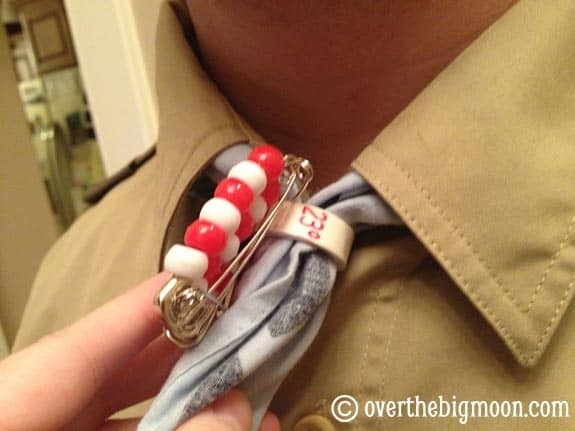 You will want to have adult on hand, cause sometimes closing the safety pins can be hard for the boys. 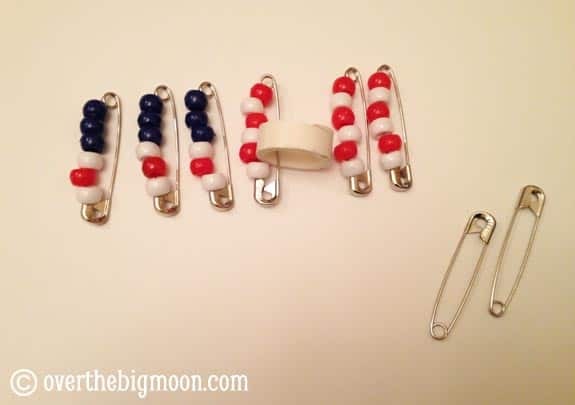 Then have the boys take 6 of the Safety Pins and create the following six combinations! 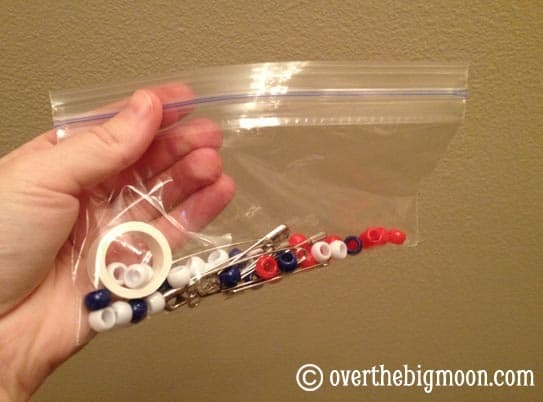 3 pins with blue, red and white and tehn 3 pins with just red and white! 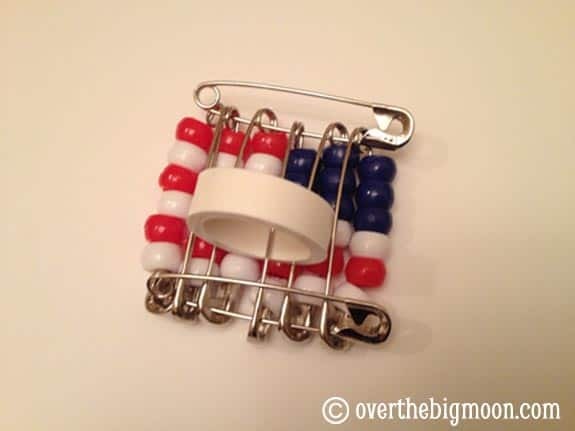 You will want to add the PVC Pipe to one of the Red/White Pins! When feeding the beads onto the pin, have the boys keep the same side of the pin as the top. Basically, you want to make sure that the white beads are on the side of the pin that closes. Once they’re done, have them line the rows up like I did in the above picture. 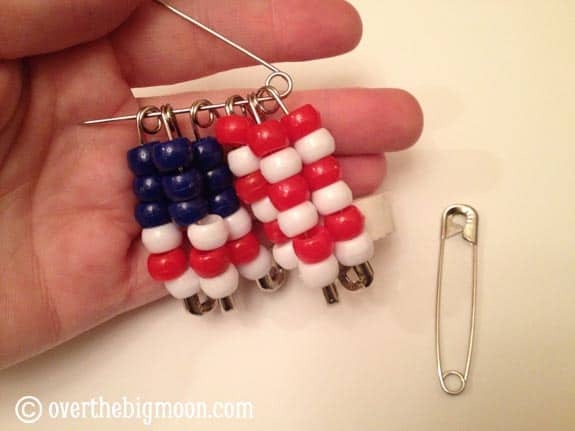 Then take one of the extra safety pins and feed it through the flag pins in order. Then take the last safety pin and feed it through the other end of the pins! It doesn’t matter which side of the pin is up or down. Just that the “ends” are all matching, so it hangs as even as possible. Here’s what the back will look like! Here is what it looks like on! Don’t stress if the beads don’t line up perfect! They’re little boys – they’re gonna be bouncing all around anyways! Here is what it looks like from the back, where the PVC Pipe is fed through the Neckerchief! FUN, right?!? The boys were all really excited about them! I can’t wait to see all of them looking sharp in February at the Blue and Gold Celebration!! Afacanpark top havuzu çocukları eğlendirirken fiziksel aktivitelerini yerine getirmesini sağlayan oyun alanlarıdır. I love this idea. It’s a great way to start out talking about flag etiquette. My beads dont fit on the 2″ safety pin. did you use little beads? 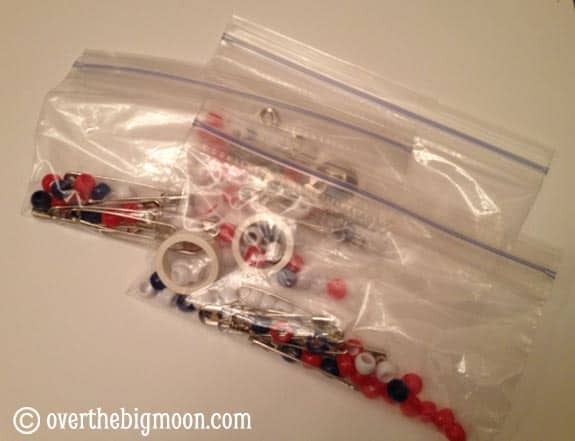 I linked all the items I used – I used just a standard Pony Bead on a Size 3 Safety Pin. Hope that helps. Feel free to change up your bead size or safety pin size to make it work for you though!! There really isn’t a right or wrong. I chose what I chose for cost reasons. 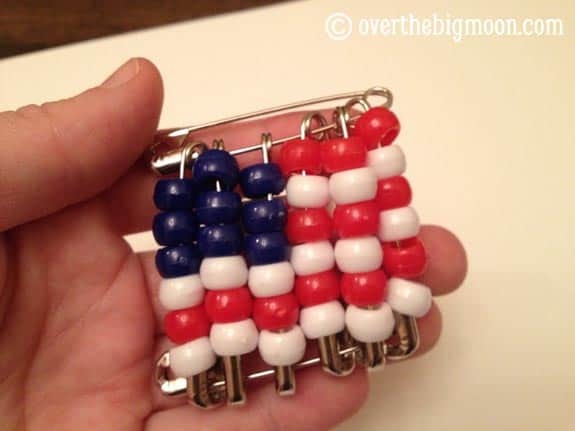 Smaller beads would allow for more rows and actually complete the flag look more. Good luck! Great idea! Can be used without the slide for Girl Scouts. Pinning to my GS board. Love it! You’re so dang creative. I love the flag. I think my girls would enjoy this craft. I pinned it. It would be great if you would link it to hobbies and handicrafts. My first grader became a Tiger Cub this year. We love it! 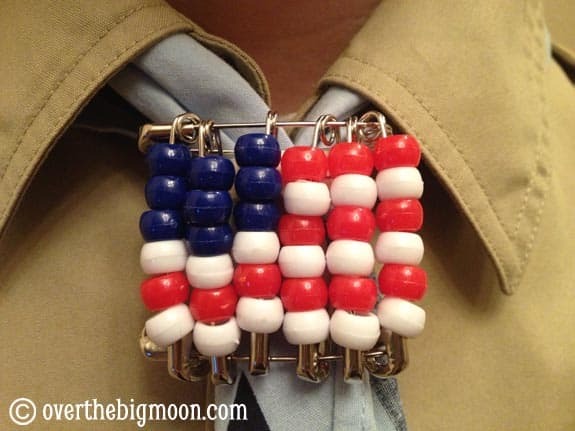 Thanks for sharing this…I’m looking forward to more Neckerchief slide ideas!